Learning how to fish, how to catch bass specifically, is best learned on the water, no doubt. But today we bass hunters have access to an almost unlimited source of helpful, educational information, bass fishing web sites. 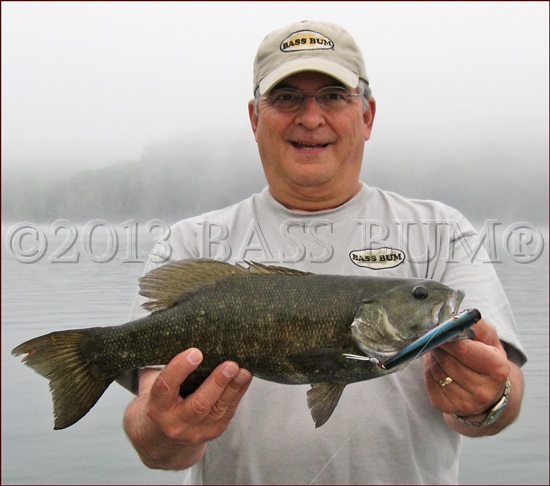 For generations anglers became knowledgeable about how to catch largemouth bass and how to catch smallmouth bass by spending time on the water and, if possible,by picking the brains of local anglers with reputations as bass catchers. These local guys were the repository of information everyone sought. The information they had acquired over the years was perceived as the key to unlock the treasure chest of successful bass fishing. This site, Bass-Fishing-and-Catching, is my outlet, besides actually fishing that is, for a passion that my wife says consumes me. I'm creating this site because it brings me a significant amount of joy and as a vehicle for sharing the "key" to successful bass fishing. Actually, it's keys, as there are an endless number of keys that produce bass in an endless number of situations. There are no absolutes in bass fishing, I don't care what anyone says. Like so many things in life, "it all depends" on the when, where, what, and why of any given situation or, day on the water. No one person knows it all. He can't. We bass fishermen are scattered across this world in every conceivable climate and encounter a wide range of diverse weather throughout the year. So to hopefully bring to the table multiple sources of bass fishing instruction, largemouth bass facts, smallmouth bass fishing tips and bass fishing techniques that focus on learning how to fish for bass, I'm inviting others who may have sites to send a link that may be placed here. Each site for which we receive a link will be reviewed and if accepted will require a reciprocal link to Bass-Fishing-and-Catching. At Cajun Custom Rods™, we build only the finest hand-tailored, custom fishing rods that are as unique as the anglers who fish them. We cater to the performance, aesthetic, and design specifications of novice, avid recreational, and the tournament fishermen who wants and appreciates only the very best in a hand-crafted, custom-fit, and one-of-a-kind custom fishing rod. All about freshwater fishing. Where fishermen, women, kids and enthusiasts alike join together for a common purpose... catching anything with fins that swims! A comprehensive bass fishing site with tips, in-depth techniques, complete tackle including lures, weights, bobbers, hooks, reels and rods as well as a forum, lodge listings and fishing for kids. Over 500 pages of everything bass!" How Do I Send My Link? Complete the Contact Us form below and send the code for your link and a brief write up about your site. Brief is the key word ladies and gentlemen. I'm not looking for a dissertation about learning how to fish for bass here. "Just the facts ma'am". Any of you remember Dragnet?